I am really struggling with Single FLAC files in MusicBee... 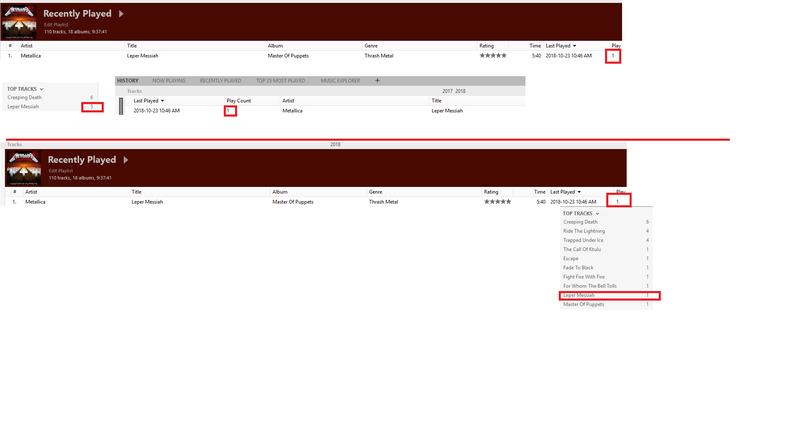 When I play a song and it finishes, the song is given the correct +1 play in "Top Tracks" in Music Explorer view. When I restart MusicBee however and check the artist's tab again it shows either 1 of 2 things. It will show +1 to every track on the album, even though I only played one song. Or it will say 0 for the track that was played. If it says 0, this seems to be a visual bug and restarting MusicBee, clicking to another album artist tab, then back to the one with play seems to correct this. To add to this issue, I organized my Single FLAC albums into folders using the computer file explorer feature built into MusicBee. I did not use the File Organizer because last time I used it with a Single FLAC it wiped my play counts. 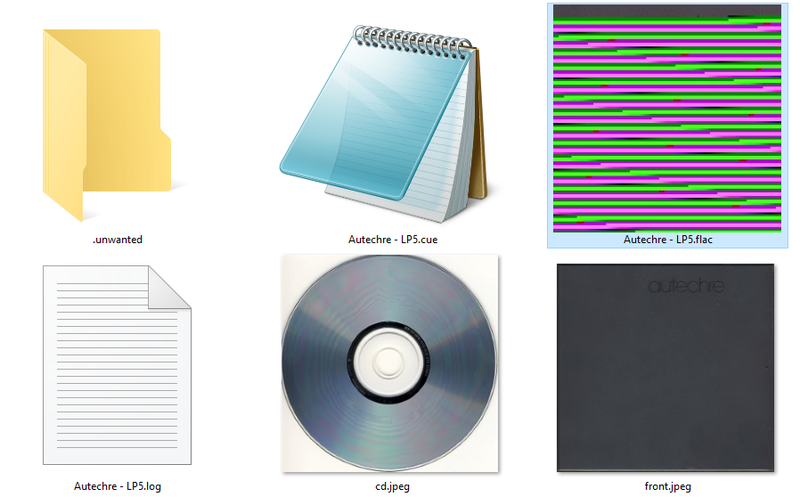 All I did this time was make an artist folder and dragged all the albums inside it. No renaming of anything. Sadly, I once again lost all my play counts for every Single FLAC album. I also lost my track ratings. foobar2000 does not seem to have any problems recording play counts for a Single FLAC + cuesheet. You can actually manually add play counts to the individual tracks split by the cuesheet. Unfortunately you can't do this in MusicBee with a Single FLAC or I could fix my play counts, though the played date would be n/a now. Single FLAC + cuesheet displays and plays just fine. It's the recording of the play counts that is not working for me. I wasn't trying to offend you Steven, just trying to explain my issue in detail. I don't know how foobar2000 records play counts for a Single FLAC + cuesheet compared to MusicBee. Maybe it stores them in some library database file, that when played, edited, or rated only effects the database. I am saying I use FLAC + cuesheet and have no issues with playcounts of individual tracks being recorded or retained, so I am not able to replicate what you say. So I suggest you use foobar which you say is working for you. Having said that i do agree the top tracks playcount in the music explorer doesnt immediately display the updated playcount so i will fix that. Hi Steven, I pm'd you my settings file. 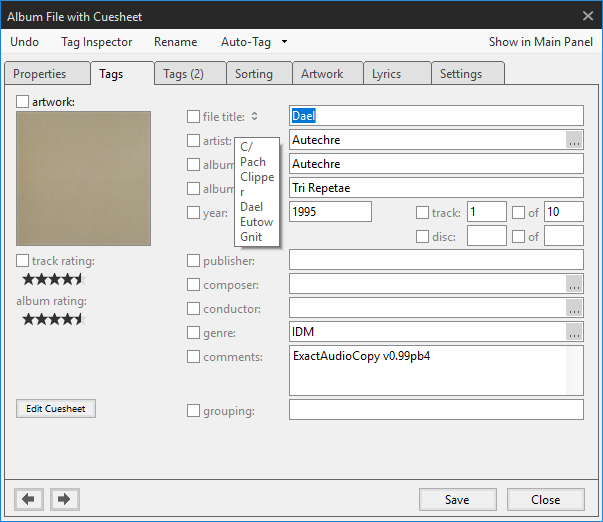 I remember in the past, on an older version of MusicBee, I edited some of Single FLAC file tags in the tag explorer, not through the edit cuesheet button. I thought that might be the problem, but then I found some Single FLAC I have never touched and those lost their playcounts when I moved the folders through file explorer in MusicBee. I found some Single FLAC I have never touched and those lost their playcounts when I moved the folders through file explorer in MusicBee. No I did not encounter that bug thankfully. The file explorer built into MusicBee is very nifty feature. I use the file organizer a lot, but for Single FLAC files it's hard to rename them without messing up the cuesheet. So for that I use file explorer. Do you think in a future version you could add a way to manually edit the play counts of a Single FLAC? I updated to the latest version and the problem persists. I will play a song in full and the playcount is increased from 0 to 1 on the "top tracks" window. If I check the history window, it will show 1. If I play the song again, it will correctly update to 2 in top tracks and 2 in history. However once I close MusicBee, it goes back to showing 1 on both tabs. I also checked the "recently played" playlist and added playcount display field and it shows 1. I verified my Single FLAC albums that I was testing and made sure there were no errors in the cuesheet. I also removed the artwork just incase there were any bugs. as an experiment, do the same again, but also edit any unrelated file in the library and save it. When you restart is everything as you expect? I did as you suggested but it didn't make a difference. I edited a song while a single FLAC was playing and also when one was not. I noticed even when changing tabs or playing a song from a different artist, the play count will go back to 1. Here is a picture of what I mean. In the bottom half of the picture, the play count was reset to 1 and all I did was change tabs or play a different song by another artist. I am now having the rating bug that happened to me back in September last year. It only affects single FLAC files. I click to rate a track, but it rates another track from the album instead, usually the 2nd track. When close MusicBee or rescan the album, it breaks it. Been trying to figure this out on my own still not sure but I found another bug. The 'title' of the single flac changes to the first track, not always, but sometimes, and that's when it breaks the album turning it into a single track. Just found another bug. Renaming a folder through computer a node will cause a single FLAC album to lose all it's playcounts and ratings. just confirmed this with two albums.